American Third Party Report: Security guru John McAfee’s Twitter account was hacked. Security guru John McAfee’s Twitter account was hacked. Notorious computer pioneer, John McAfee, has gone on a Twitter rant to defend his security credentials after his account was allegedly hacked. 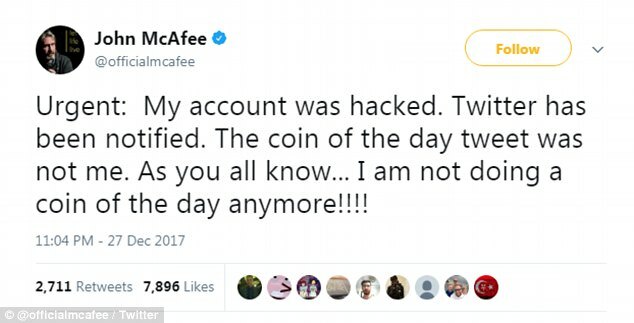 McAfee, who made millions creating the popular McAfee anti-virus software, claims his Twitter account was compromised as part of an elaborate scam. The 72-year-old says cyber criminals used his account to promote lesser-known virtual currencies to his 550,000 followers. But some have expressed skepticism about the hack, with many noting that he does not have a reputation for being credible. They also claim the tweets are simply a publicity stunt to promote the ‘John McAfee Privacy Phone’ – a $1,100 (£800) device which he claims will be the world’s most hack-proof phone.